Beef Jerky Recipes » Blog Archive » Dead Meat Beef Jerky – Product Release! Dead Meat Beef Jerky – Product Release! In keeping with the tradition of carrying only U.S. made jerky products of superior quality, Jerky.com now offers the greatest value on a single pound of beef jerky available anywhere. 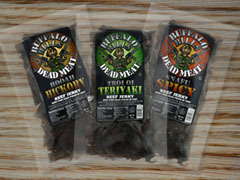 Drum roll please……Introducing – Buffalo Bills Dead Meat Beef Jerky! Made from 100% U.S choice beef and all natural ingredients like our other gourmet jerky products, you would expect a gourmet price. But, CMON…you should know us better than that! Jerky.com is proud to offer 1 full pound of Dead Meat for only $22.99 including FREE SHIPPING! Bacon Jerky is now available!